Steve Carell Stars in the Hilarious Comedy that is perfect for the Entire Family! Synopsis: Disney’s heartwarming comedy will have your entire family laughing out loud. Based on the best-selling book, it follows the exploits of Alexander as he experiences the most terrible and horrible day of his young life and wonders if bad things only happen to him. 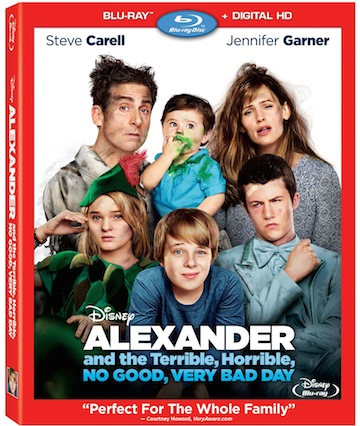 But he discovers he’s not alone when his dad (Steve Carell), mom (Jennifer Garner) and family live through their own terrible – and hilarious – day. It will tickle everyone’s funny bone, and warm their hearts as they discover how even on rotten days, families can grow closer. Cast: Steve Carell (Crazy, Stupid, Love, TV’s The Office) as Ben Cooper, Jennifer Garner (Dallas Buyer’s Club, TV’s Alias) as Kelly Cooper and Ed Oxenbould (Paper Planes) as Alexander Cooper, Bella Thorne (TV’s Shake It Up!) as Celia, Dylan Minnette (Prisoners, Let Me In) as Anthony Cooper. Common Sense is the nation’s leading nonprofit organization dedicated to helping families and educators thrive in a world of media and technology. We rate, educate, and advocate on behalf of kids, families and schools. Common Sense offers the world’s largest and most trusted library of age-based ratings and reviews of all types of content targeted at kids, and our research-based curriculum and tools are used in over 75,000 U.S. schools. For more information, go to: www.commonsense.org. The first of its kind, the Common Sense Seal recognizes and champions films that delight families with enriching stories and positive messages. Since 2003, Common Sense Media has been helping families discover great media through its library of independent, age-based ratings and reviews, and the Common Sense Seal will honor the best of the best in family movies. Common Sense Seal recipients must meet our highest standard for quality storytelling with worthwhile themes and inspiring role models. These aren’t only great films; they’re great films that can make a meaningful difference in kids’ lives. Our in-house team of movie reviewers, editors, and child-development experts will review all wide-release movies as they make their theatrical debuts. Recipients will be announced when the films are released so parents will know they’re the best picks for the whole family when heading to theaters.